Strategically located on Nathan Road, Tsim Sha Tsui, Hotel Miramar has welcomed global travellers with an unmatched tradition of warmth and hospitality for nearly half a century. Recently redecorated to reflect a contemporary chic, the Hotel Miramar boasts easy access to every part of the city. It is also next to the highly popular Miramar Shopping Centre and overlooks the greenbelt of Kowloon Park. Famous landmarks like Star Ferry and Cultural Centre are all within walking distance. At Hotel Miramar, you will feel perfectly at home. Our heartfelt caring and attentive services have for decades made us the choice for discriminating travellers from around the globe. 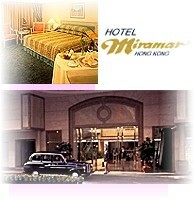 The next time you visit Hong Kong, let Hotel Miramar be your host. The Hotel Miramar is centrally located on Nathan Road in Tsim Sha Tsui - Hong Kong's main shopping, business and entertainment area. Near to the Star Ferry, Kowloon-Canton Railway Station and the underground MTR which provides quick and easy access to most areas in Hong Kong. All rooms are spacious and tastefully furnished, well-equipped with a mini bar, radio, a unique key-card system for extra security and much more. The Miramar Club floors feature elegantly designed Executive rooms of various styles. A more superior level of service is offered here with daily complimentary buffet breakfast, express check-in/out and and all day coffee and tea. There is also a lounge for business meetings. Standard and Deluxe rooms comprise either two single, one queen or one king size bed with room for an extra bed. Executive rooms can also accommodate three people and consist of one king or one queen bed. Interconnecting rooms are available in the Standard category, double room connects to double room which are also suitable for families. 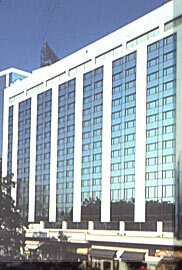 All rooms offer city views however, Executive rooms are available with views of Kowloon Park. Laptop ports are available in all categories upon request.